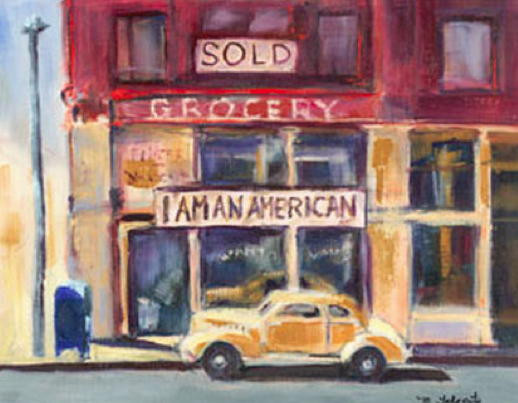 “Forced to Sell” by Michi Takemoto, based on a photograph taken by Dorothea Lange in March 1942 at 13th and Franklin streets in Oakland. The store, owned by a Japanese American and University of California graduate, was forced to close due to the impending forced evacuation. INDEPENDENCE — On Feb. 19, 1942, President Franklin D. Roosevelt signed Executive Order 9066, authorizing the U.S. Army to exclude “any and all persons” from designated areas. While the order did not name a specific group, the Army forcibly removed and incarcerated all Japanese Americans and Japanese immigrants in California, western Oregon and Washington, and southern Arizona. The government incarcerated more than 11,000 of these men, women, and children in Manzanar. In 1992, after decades of grassroots efforts by Japanese Americans and others, Congress established Manzanar National Historic Site. Since then, the National Park Service (NPS) has worked with scores of stakeholders to preserve and interpret Manzanar and its stories. This year marks the 75th anniversary of EO 9066 and the 25th anniversary of Manzanar National Historic Site, which is hosting three special art shows this spring in recognition of these significant milestones. Artist Michi Takemoto’s show opens Saturday, Feb. 18, featuring a series of watercolors she painted from historical photographs, including many taken 75 years ago. Her parents and two-year-old brother were incarcerated at Tule Lake in Northern California before being transferred to Topaz, Utah, where she was born. Her family eventually resettled in Chicago. Takemoto spent her 30-year career as a psychotherapist in Redding, Shasta County. She will be available Feb. 18 from 11 a.m. to 1 p.m. to meet with visitors and share her work. Manzanar History Association will offer light refreshments. The show will run through late March. Left: In a photograph by Dorothea Lange, 7-year-olds Helene Nakamoto Mihara (left) and Mary Ann Yahiro recite the Pledge of Alligence at Raphael Weill School in San Francisco before being sent to the Topaz camp in Utah in April 1942. Right: Yahiro, 72, and Mihara, 72, photographed on Jan. 20, 2007 by Paul Kitagaki, Jr. Mihara’s father, who owned American Fish Market in San Francisco Japantown, was arrested by the FBI but reunited with his family at Topaz. Yahiro’s parents were split up; her mother, who taught Japanese, was arrested and sent to a separate camp. She never saw her mother again. 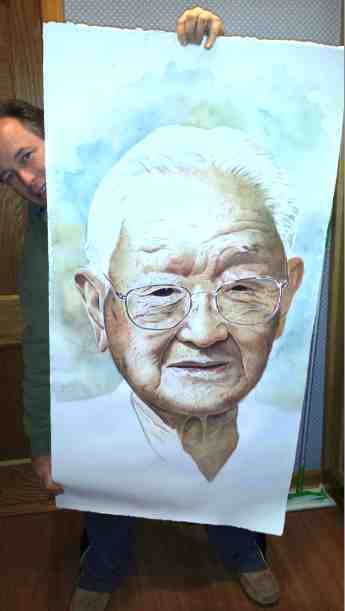 Steve Carvallo with his portrait of Manzanar incarceree Sam Ono. Pulitzer Prize-winning photojournalist Paul Kitagaki, Jr. will display his Japanese American incarceration photo series beginning in early April. For more than a decade, Kitagaki has searched for those photographed by War Relocation Authority (WRA) photographers — including Dorothea Lange, Clem Albers, Tom Parker, and Francis Stewart — in 1942. He has located and re-photographed dozens of people, often in their historic poses. He records and preserves their stories as well as images. His show will run through mid-May. Artist Steve Cavallo’s show opens May 27. An art professor in New York, he has completed numerous portrait series highlighting human rights issues, including Holocaust survivors and Korean comfort women. He is creating a series of portraits of people who were incarcerated in Manzanar and other camps, pairing their images and quotes. The show will also include others with direct connections to Manzanar. Cavallo’s show will run through the fall. For those unable to experience the shows in person, each artist’s works are featured online. The exhibits will be featured in the Manzanar Visitor Center, open 9 a.m. to 4:30 p.m. daily. Admission is free. The center also features extensive permanent exhibits and a 22-minute introductory film, “Remembering Manzanar.” Nearby, a World War II-era mess hall and two reconstructed barracks interpret the challenges of daily life. An auto tour road circles the site, highlighting Japanese gardens, historic orchards, the cemetery, and more. Manzanar is located at 5001 Hwy. 395, six miles south of Independence. For more information, call (760) 878-2194, ext. 3310 or visit the website at www.nps.gov/manz or Facebook page at www.facebook.com/ManzanarNationalHistoricSite.